Considered by many the strangest place in all of Key West (and there are a lot of strange spots in Key West! 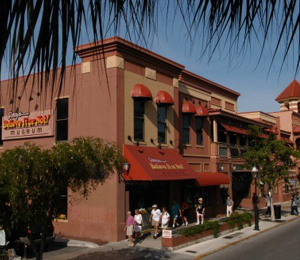 ), Ripley's Believe it or Not Museum is a true Key West gem. The museum has sat on the famous Duval Street for quite a while now, and guests from all over the globe still flock to the bizarre museum. The museum is a collection of odd, unique, and bizarre relics and stories. There are over 500 exhibits that are categorized into 13 different galleries and take up nearly 10,000 square feet! The museum is great and entertaining for people of all ages! And it is a great reprieve from the hot Key West sun. Your mind will be expanded by Robert Ripley's collection of bizarre relics. Robert Ripley was a curious man who dedicated his life to traveling the world and collecting odd and memorable stories, relics, antiques, pictures, etc. Ripley went to over 200 countries throughout his life and seemed to always find something new to add to his never-ending collection. In his museum in the southernmost island of Key West Florida, for instance, you will see such strange items as a shrunken human torso and a prehistoric Mastodon skeleton. You will also hear the stories of impressive and awe-inspiring humans such as the world's tallest man who stood at 8 feet and 11 inches tall when he was just 22 years of age! Or what about the king who inspired the story of Dracula? You will learn about his story also! The museum combines video, audio, and visual exhibits to make the experience an exciting and interesting one for the whole family! I have been to the Bahamas many times, but Ripley's Museum is one of my favorite trips! It includes everything that everyone should do here. As a Bahamas veteran, I can say only the best about this experience!